First of all: please accept my sincerest apologies! It's been almost a week since I've last posted, but I've kept a journal to remember the details, and have condensed the most memorable moments from the last few days into a couple combined posts… Thank you to those who have kept checking the blog regularly, and for the concerned emails I've received over the last few days making sure I'm okay! I'm fortunate to have such lovely friends and family members in my life. We woke up super early in Kampala on Friday and received a phone call from Shiraz Uncle making sure we had been picked up and were okay heading to the airport. Of course we hadn't yet been picked up as it was still early, but he followed up with the driver and asked us to let him know when we reached the airport safely. It was so touching to have him check up on us, ensuring that we were looked after by the Ismaili congregation for the entire duration of our stay in Kampala. We had a quick stopover in Nairobi, after which we boarded the second plane to our final destination: Dar es Salaam, Tanzania. 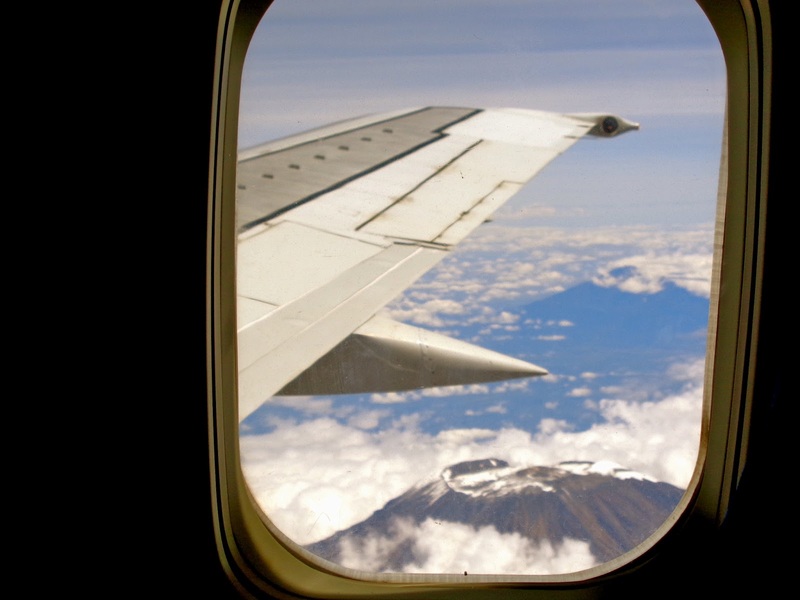 En route, we saw the magnificent Mount Kilimanjaro from the window, and it really was a breathtaking sight, looming up above the clouds! We landed in Tanzania and immediately felt the heat. It's hard to believe they're only just entering their summer months now, and this is not nearly as hot as it gets! While we were waiting in line to withdraw some cash, (which has been quite the stressful experience in each place we visit) we met a few foreigners who visit Tanzania frequently. They recommended that we stay in the YWCA tonight, for it's proximity to the port and its cheap room rates. We checked in and walked to a nearby local restaurant for lunch. I had "beef mishkaki" and it was delicious! My friends from East Africa always rave about how much better the meat is over here, but I didn't realize how much better it would be. 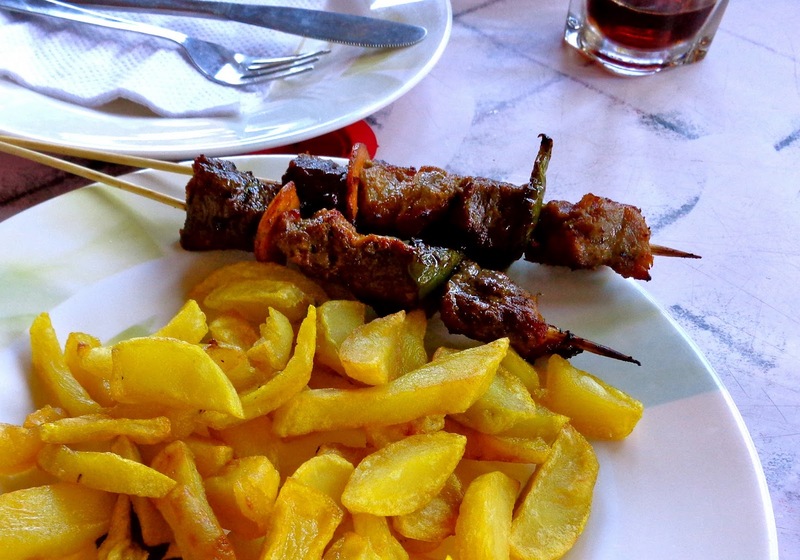 It was very fresh and tender, and it gave me a great first impression of Tanzania. I must say though, my dad's marinades and bbq style rival the best of the best, so if he had access to these fresh meats at home, his mishkaki would be out of this world! Since we hadn't been connected to the internet for the past few days, we thought it would be nice to relax at the Serena and get some work done. We got dressed up so we would fit in with the upscale crowd, and walked over to the gorgeous outdoor bar. The Serena Hotels have really done it right, as each hotel is like a peaceful haven inside the crowded cities in which they are built! We ordered our drinks, and I was surprised to see how tall my coke bottle was - definitely going to bring one of these home for my dad's collection! Unfortunately however, the wi-fi was not free, so I wrote out my Masaka blog post, while Jamie caught up on his tv shows. I needed to finish a Physics test before the Saturday mid-day deadline, so we ventured out into the city to find cheaper wi-fi access. 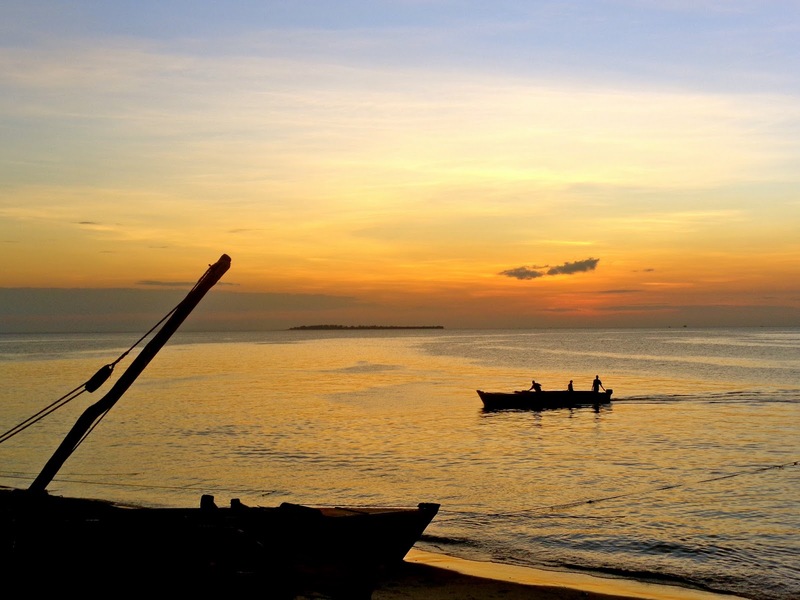 We were SO lucky - we found the most hospitable people in Dar and were welcomed with open arms at the Holiday Inn in the city centre. This was quite the high class Holiday Inn, and immediately the concierge assistants gave us free vouchers for a full day of internet use, even though it's normally just half an hour of free wi-fi. We were wandering around upstairs looking for plugs, when we met a waiter, Firoz, who took such great care of us all evening. He sat us on the rooftop patio away from the noise inside the bar and brought us free snacks, ensuring that I was able to complete my Physics test comfortably. He assured me that he had no ulterior motive, but instead referred to me as his sister, starting in a new place far away from home. When we were leaving, he handed me a small note of 100 rupees from India. He mentioned that someone had done the same for him when he had arrived in Dar, and that it was meant to be a symbol of good luck. He was metaphorically investing in my future, and it was a very kind gesture. I was full from the snacks, but Jamie wanted to eat a big, American-style dinner, so while we were walking through the streets of Dar, we experienced another side of the city. The streets were quite dirty, littered with garbage, and street kids were unfortunately setting up their beds along steps of large corporate buildings. While trying to avoid stepping on a pile of garbage on the path, my foot slipped on some gravel, and I (not so gracefully) fell, somehow scratching my entire shin, cutting through my pants and landing on my chin. Thankfully, my chin is just bruised a tad, and the gash on my knee is just another addition to the battlescars from running around the playground as a child. What's quite unfortunate though, is the rip in my pants! (For those who know my wardrobe, these are THE pants.) I'm grateful however that I wasn't hurt any worse, and I know I can always find a replacement for the pants! Saturday morning I had the customary cold shower, and refrained from squealing. It's quite surprising how quickly I've become used to the ice cold showers! 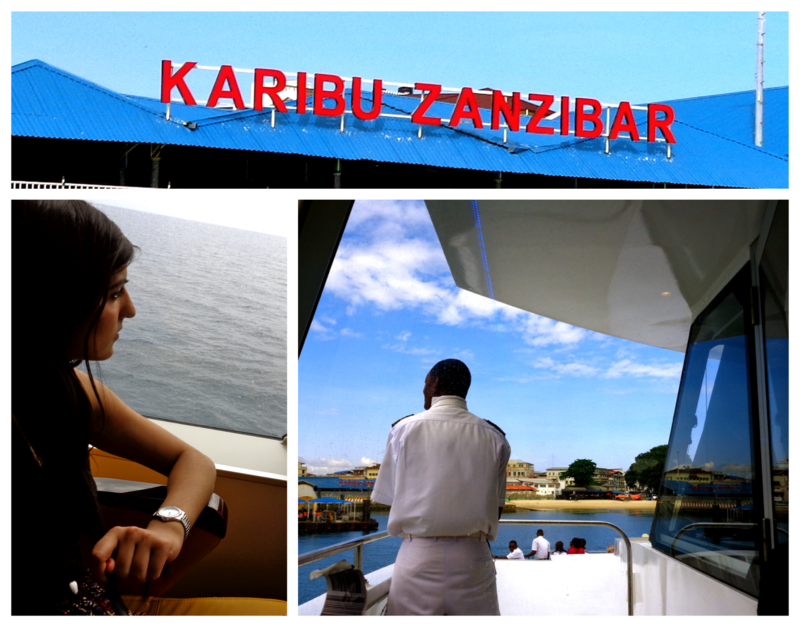 We had a quick breakfast and hailed a taxi to take us to the port for our ferry ride to Zanzibar. Unfortunately however, the taxi driver forgot to put my luggage handle down when he lifted it, and ended up snapping the handle right off. It's a nice bag too, but thankfully I've learnt not to value material things too much, as they come and go, and are far less valuable than one's safety, health, relationships and happiness. We arrived at the port and were swarmed by ferry company representatives sticking their hands in the windows of the car with flyers and price promotions. Thankfully the people we had run into the day before had advised us on which company to go with, for safety and reliability's sake. We purchased our tickets, and while we were waiting, went to the bank. I experienced my first case of Police corruption, as our taxi driver bribed the officer to let him park on the road where Jamie told him to wait. I was a tad scared, as I was by myself in the back with all of our luggage, while the policeman and taxi driver angrily argued in Swahili, every so often gesturing back towards me. The bribe ended up working in the taxi driver's favour, and 15 minutes later, Jamie returned so we could get on our way. The boat ride was lovely, and as we were leaving we ran into another Canadian, Nicola, who was visiting Zanzibar for the second time. She graciously led us to her hotel, which was nearby, and we were thankful for not having to aimlessly wander with broken luggage trying to find a place to stay! 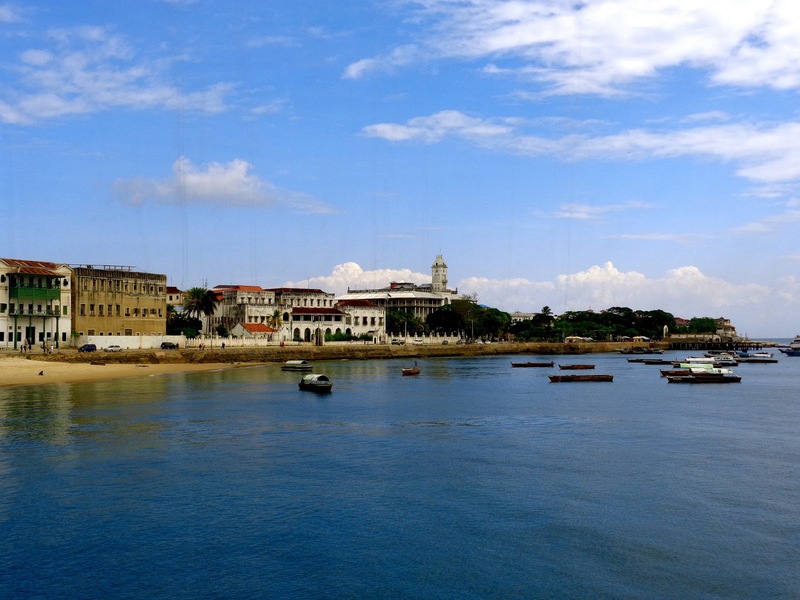 The hotel was a gorgeous boutique hotel, right on the edge of Stone Town, with great Arabian-themed rooms. After a quick lunch together with Nicola, I excitedly put on my new pants, and Jamie and I set off on a walking city tour to experience the exoticness that is Stone Town. 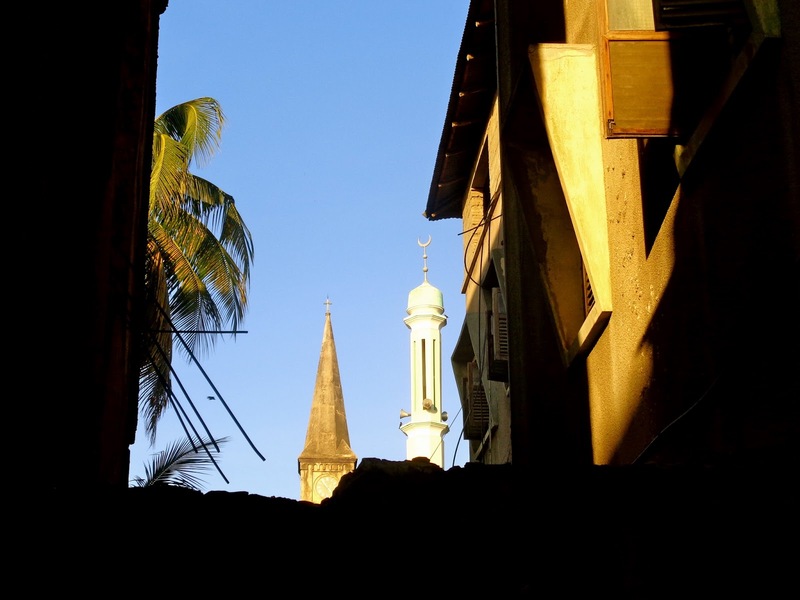 With tremendous Arabic and Indian influence, this city is a fascinating place. The architecture is incredible, and one could easily get wonderfully lost wandering through the many alleyways. On our tour, we visited the first trading market in Zanzibar, and the spot where all of the catches from the sea come to be auctioned off centrally. 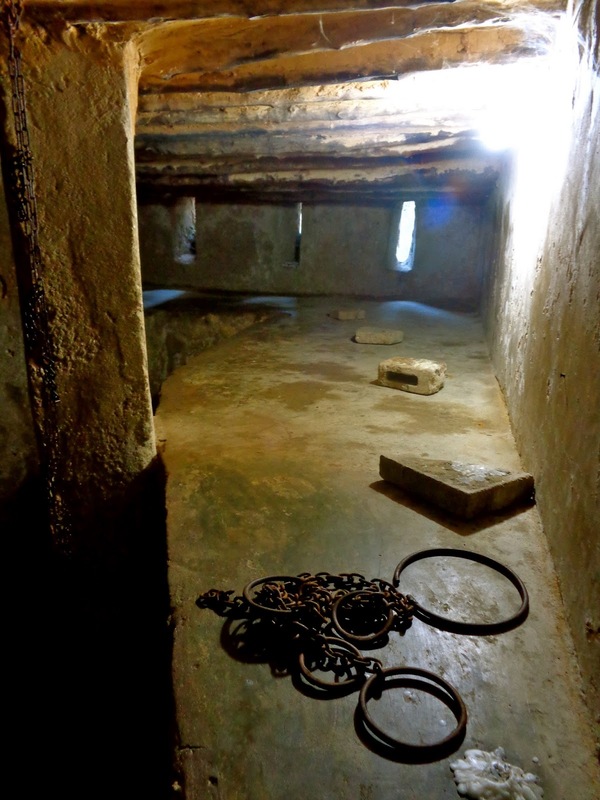 We also toured the former slave trading grounds, and the holding cells of many of the slaves, which was pretty shocking to see. We also found a spot where there was a fantastic view of both a church steeple and mosque minaret side by side, which I thought was really neat. It's always nice to see how different cultures and faiths can harmoniously live together. My favourite part of the tour, however, was Forodhani Park. This ancient park used to be in ruins, but His Highness the Aga Khan, through the AKDN's Aga Khan Trust for Culture, invested heavily in it a few years back, funding its restoration and upkeep. It is now a lively place, central for all townspeople, and an attraction for all tourists. Not only is there lots of space to relax and sit in quiet contemplation against the picturesque landscape, but there is a playground for children, and the entire park transforms into a night market in the evenings, where vendors proudly sell fresh juices, snacks, and their freshly grilled catches from the day. Even though there were so many foreigners enjoying the market, and Nicola and I really wanted to eat there, Jamie didn't trust the cooking, so the three of us went instead to an expensive restaurant for dinner. There was live Tebab music playing, and we sat on cushions for the meal. Afterwards, we made our way to Mercury's (where all menu items are wittily named after Freddy Mercury's favourites, as he was born in Stone Town) for some dessert and coffee. 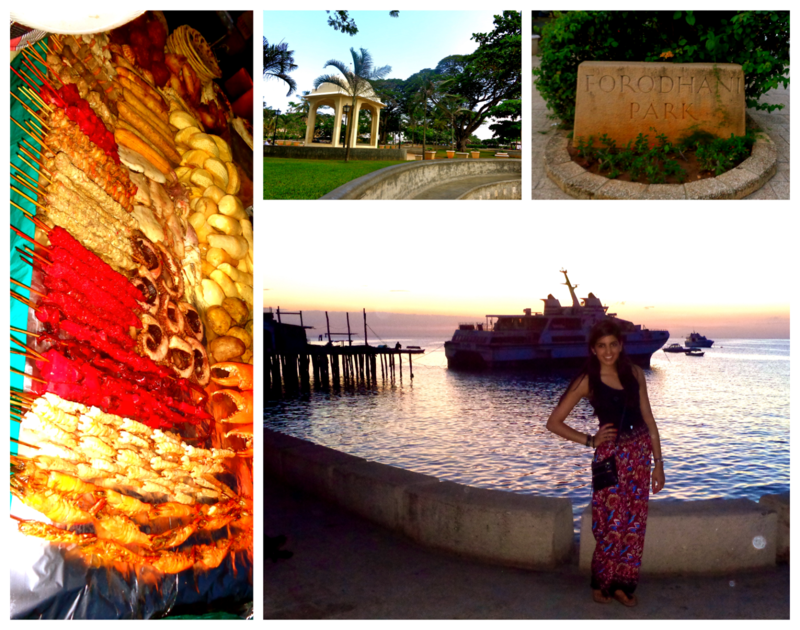 The next morning, we went on a Spice Tour just outside of Stone Town. We got to taste the spices right off their plants, and I surprised myself and the entire group with how familiar I was with all of the spices, naming them immediately when we were asked to guess the spice from its smell. I guess having grown up in a house that's cuisine is a flavourful fusion of East African and Indian has led me to subconsciously be very aware of more spices than the average person! At one point, the tour guide handed Jamie a little grass ring and told him to give it to me. We had to explain to the tour guide that we're not a couple, but rather just colleagues touring East Africa for a few days as our work has just finished. It's quite funny how many times we've had to explain that we're not a couple over the last few days, and how many puzzled stares we've gotten when we ask for two separate rooms! The tour guide ended up giving the ring directly to me instead, and he proceeded to make one for each of the ladies in our tour group, which was very sweet. 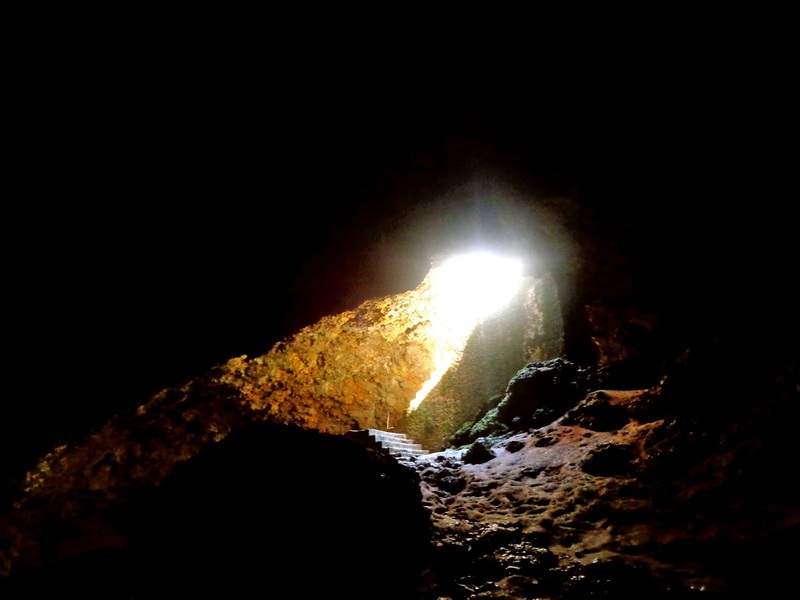 The tour ended with a traditional lunch, a visit down into a slave cave, and a quick trip to a remote beach on the outskirts of town. 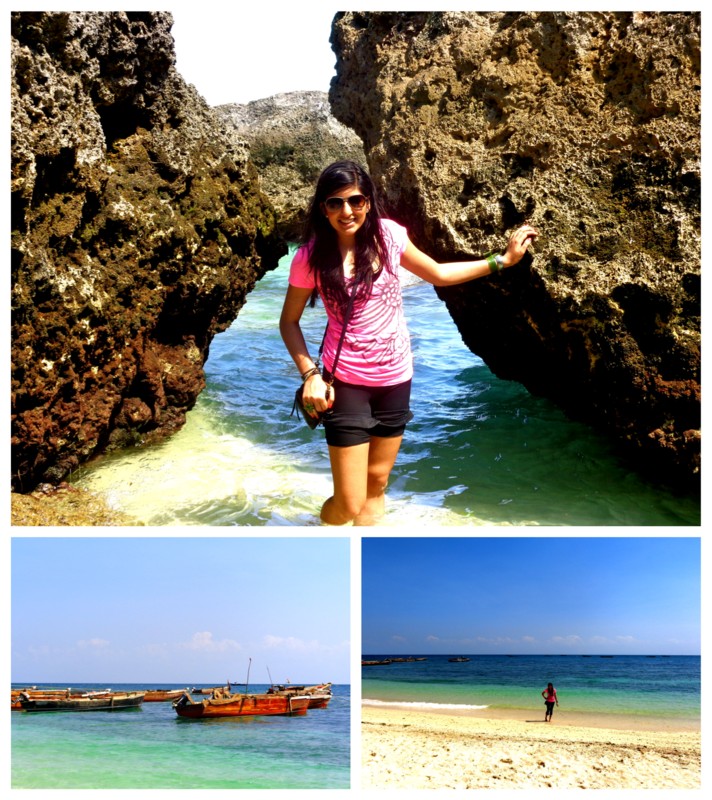 It was absolutely gorgeous, and the fine white sand and brilliant blue water took me by surprise. For some reason, I expected the beaches to be a bit more like the European beaches, with more rocks. Nevertheless, it was stunning, and made me quite excited to be heading to the East Coast beaches the next day. I did a bit of work in the afternoon before meeting Nicola and Jamie for dinner, at Mercury's once again. 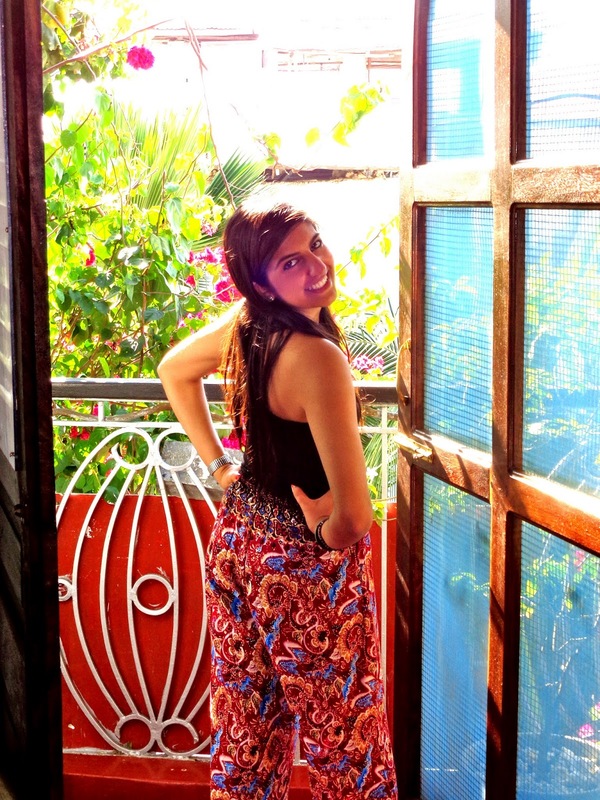 Once we reached the hotel, I just sat in the rooftop terrace for a while, admiring all of the stars, and the view of the magical place that is Zanzibar!